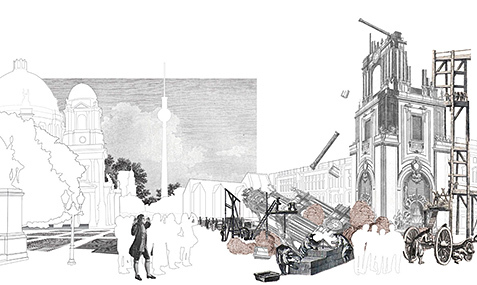 Compromise in regards to concept and design is characteristic for the construction of the Berlin Palace. Endlessly tiring debates follow in consequence. For that reason, our project envisions the radical reformation of the Palace's surrounding, back to the condition of 1716. In spatial terms, this implies for example the reconstruction of the historic rampart near Bebelplatz/ Neue Wache. In addition, the present pleasure garden will be removed. As in 1716, a paved square is to be built. Furthermore, the historic Apotherkerflügel, the Lusthaus as well as the Spree River and Spree Canal are redesigned in their historic form, as far as possible. This reconstruction without compromise is designed as a specific framework, whose content, however, remains to be enacted. Thus, diverse content is being added by its thematic programming (e.g. reenactment of historic events). A quarterly held public forum in the Agora of Humboldtforum will set the stage for a public negotiation in which themes, organization and realization of the program are being discussed. All this aims towards the initiation of a broad, dynamic, dialogic and democratic process that enables a coexistence of diverging understandings of history.